Although some U.S. manufacturing and service-sector jobs have gone overseas, politicians continue to ignore the outsized effect of automation on job loss, blaming foreign countries and immigrants instead. The U.S. manufacturing sector actually produces twice as many products as it did half a century ago but does so with one-third fewer workers, mostly because automation has made American factories more efficient. Most experts agree that U.S. jobs aren’t being stolen by other countries, but rather by our own robot overlords. An Oxford University study recently suggested that almost 50% of some jobs will be eliminated or reduced within the next several years due mostly to automation.And as artificial intelligence and robotic hardware continues to advance at a phenomenal pace, there are concerns that the rate of job loss will accelerate. Thinking in terms of automation is also important because job loss due to automation inordinately affects the most vulnerable among us: low-income communities, ethnic minorities and immigrants who perform unskilled labor. So Should We Blame Automation Instead? Not really. Things are a little but more complicated than that.For one thing, automation is nothing new. The Industrial Revolution transformed the way we worked. It allowed for the population to grow from about a billion people to over seven billion in just under a century … and yet all of these billions of new humans still had plenty of work. Why? Because automation created new industries: instead of taking a horse-drawn carriage to your friend’s home, a machine could now drive you there in a fraction of the time. Even though this new automobile industry led to the elimination of some jobs, it led to the creation of many more unprecedented professions such as mechanics, insurance agents and race car drivers. So even though automation may disrupt some jobs … it’s also likely to create many more new jobs. For instance, robots are making travel to Mars a realistic possibility - an endeavor already resulting in the creation of hundreds of thousands of new jobs and the creation of multiple new industries. What this means is that automation doesn’t always eliminate jobs, sometimes it changes them or creates new jobs. Why didn’t the creation of ATM’s result in the mass layoff of bank tellers nationwide? ATM’s had been around for 30 years, yet bank teller jobs continued to increase throughout the past thirty years because bank employees could now focus on additional revenue-generating activities such as selling financial products like mortgages and business loans. The bank could also hire software engineers to create apps and other software to help the bank generate additional revenue. Which leads me to my third point: oftentimes the jobs automation may one day create are unfathomable at the time automation begins causing initial disruptions in the labor market. For instance, the bank tellers from the 1980’s in the example above couldn’t possibly have imagined a future where bank employees would be coding iOS apps 30 years hence. Likewise, we are similarly hampered when trying to think of the new industries that will come about as a result of automation in the future. The grievance politicians are attempting to harness isn’t about automation so much as the disruptive transition of old-tech to new-tech jobs and the pain this disruption causes, particularly for older workers or workers in industries vulnerable to this disruption. A 58-year-old service worker or truck driver maybe able to transition to a new-tech job such as coding iOS apps, but it’s unlikely and very difficult. For politicians, the pain caused by this transition is a complicated and unpleasant idea to sell (after all, it’s taken me this long to explain the problem) and its why they focus on the much easier to understand idea of “foreigners are your stealing jobs”. So What Can You/We Do? Vote for candidates who speak intelligently about automation and provide real solutions rather than diatribes about foreigners. If you are a young person like one of my students, spend your valuable resource (e.g. time) to volunteer, work for, or start an organization that helps retrain middle or lower-income workers. As a young person, you should also consider what kind of job you will have. Over the coming decades your job is likely to change due to automation. Consider how it will change and what you can do to be nimble and transition into a new career. As a community member, you can encourage the government to create or fund effectiveretraining programs that help those most impacted by automation transition from old-tech jobs to new-tech jobs. If you are someone of means why not donate to nonprofits that do this work? If you are a policymaker, elected official or community leader, consider creating programs that provide financial assistance or insurance to workers transitioning from higher to lower wage jobs. And if you are or will be affected by automation, find the number of growing skill-based retraining programs in your area and enroll over the weekend. It will be worth your time. Some of these companies (like AT&T) hold dominant market share in multiple industries, like television and telecommunications. Wireless carrier market share as of 2018. 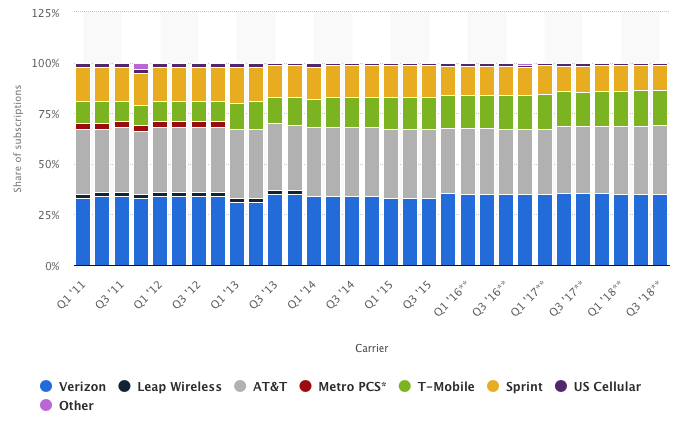 The top three carriers (T-Mobile and Sprint will soon be one company) is almost 100%. We call these tripartite arrangements oligopolies. Unlike monopolies where one company dominates a market, an oligopoly consists of a handful of companies (usually three) that end up having a significant influence on an industry. Today the problem is not just an oligopoly in an industry or two, but dozens of oligopolies throughout the country. Everywhere you look, out pops an oligopoly. As companies merge (Comcast bought Time Warner, T-Mobile is buying Sprint) they have little incentive to remain competitive. In fact, they are incentivized to raise prices as high as possible to pay for the cost of a merger or to deliver even higher returns to shareholders. The highly consolidated American high-speed internet industry provides the clearest example of this trend: In 2014 Americans were already paying more than double what European consumers paid for high-speed broadband internet. This number has only risen in the past five years. It’s not just consumers who lose out, but also vendors that sell goods to these companies and the employees who work there. Apple, Wal-Mart, Amazon and other dominant companies have been known to continually suppress wages of workers well-below normalized market rates and pay their vendors and suppliers as little as possible. The money they save remains idle or generates dividends for the company’s shareholders. For instance, Apple is currently sitting on $240 billion dollars of cash, not including other assets like inventory, land etc. … just cash … $240 billion of it! If Apple were a country, it would be one of the 50 wealthiest nations in the world based on cash reserves alone. The effects of consolidation and diminishing competition filter down to the community level. Workers make less and the products they wish to purchase with their diminishing wages cost more. It’s a vicious cycle. Low wages force employees to work longer or take up second jobs (Americans already work more than counterparts in any other industrialized nation). Ultimately this means less time spent on healthy activities, less attention paid to raising children, and less cognitive bandwidth devoted to civic activities like making informed voting choices. The U.S. has some of the strongest free speech laws in the country. Political speech, i.e. speech undertaken for the purposes of campaigning or to make a political point, is among the most protected forms of speech. Nonetheless, despite its protection, speech that incites people to imminent lawless action doesn’t usually have free speech protection and one can be prosecuted for inciting people to commit violent acts (all rights are limited). Apply the elements to the remarks made in the video. Does candidate Trump’s speech 1) incite people to 2) imminent 3) lawless 4) action? On the other hand, here’s an example of a heckler during another 2016 campaign rally. How does Obama create an environment that allows for the expression of speech without raising questions about imminent violence etc.? Which approach do you find more productive for engaging in political dialogue? Importantly: what legal, political and policy limitations is Obama working under compared to Trump (remember that Obama is a sitting president at the time this video is made)? Controversy abounds in the political moment in which we now live. That’s why its even more important to distinguish between what is ethical (the process of distinguishing right from wrong) and what is legal (the process of determining right or wrong based on a specific ethical system and then meteing out punishment). An ethical action may not necessarily be legal, a legal action may not necessarily be ethical. For instance, in our patriarchal society we may say that “a woman who has left her children to go out drinking is bad.” This is our moral judgment against her. But as Jocelyn Pollock notes in her book on ethical decisionmaking, we can think of this moral judgment as the tip of a pyramid. If forced to defend this moral judgment, we may turn to some norms or rules that we live by, such as “children should be looked after” or “one shouldn’t drink to excess”. These rules attempt to explain our moral judgement (a woman who left her children to go drinking is bad because children should be looked after.) These rules are often codified into law that makes them punishable by the state. For instance, all states in the country make it a crime to neglect the welfare of a minor child. But what if someone asked “why should children be looked after?” The answer to that question eventually forces one to reveal their ethical system. An ethical system sits at the bottom of the pyramid and informs everything that comes after. For instance, your ethical system may be based on religion. You may believe that God commands one not to drink to excess, or in many religions, not to drink at all. Your ethical system may be based on utlity, i.e. a system that says the greatest good for the greatest number of people is more important than the greatest good for the smallest number of people. A mother that goes out drinking may be having a good time, but under a utilitarian system, by endangering the welfare of her child she is endagering the community at large, and thus her actions are unethical. The utilitarian system of ethics also highlights how the law is different from ethics. In the wrong hands, the utilitarian system of ethics can justify some truly disturbing or abhorrent actions. Even today, political leaders often justify the genocide of minority populations with the utilitarian notion that eliminating a small percentage of their population will benefit the larger whole. The law would find such a politcal leader guilty of crimes against humanity, whereas a system of ethics such as utilitarianism, would not. Kristy Chatelain’s “Brooklyn Changing” series highlights the physical changes gentrification brings about, often at great cost to the original residents of urban areas that are being transformed by unfettered construction. More nuanced than angry, her photos depict less than five years of change in each photographed location. In many cases, gentrification often seems to sterilize a previously vibrant urban landscape. Though gentrification can have many positive benefits, it is often also a form of community displacement where politically, economically and socially powerless communities have to spend scarce resources to leave their homes and neighborhoods in the face of rising rents and a rising cost of living. I am guilty of contributing to this cost as someone who moved into a gentrifying neighborhood. Displacement is an important issue because state, local and federal government authorities often provide no assistance to displaced communities, who must now live farther and drive longer to jobs in the neighborhoods where they used to live. I’ve taught courses on privacy rights for ten years and even though privacy rights have strengthened during that decade, each day brings more attacks on companies that hold your user data. This can result in real financial harm for Americans. For instance, someone opened up a Home Depot credit card in my name using information like my social security number and home address that they had stolen from a company database. This ended up costing me four hundred dollars in credit card bills for items I never purchased! Use Two-Factor Authentication. Almost every major online company (such as Google, Facebook, Amazon and others) allow their users to implement two-factor authentication. If you haven’t already, turn that setting on. With two-factor authentication, when you login you are required to go through another step beyond entering in a username and password and enter in a third piece of information, usually a string of letters and numbers sent to your phone or email address. Since you own the phone or email address, entering in this third data point proves it’s really you logging in and not a criminal. Using two-factor authentication makes it difficult for hackers to steal your sensitive information because they have to jump through the same hoops to login and without your phone in their possession, they don’t have access to that third level of security. Here’s how Apple implements two-factor authentication. Use a VPN. A virtual private network (VPN) helps mask your internet activity by routing your information through private, third party computers as you browse. Not only does this protect your information from hackers, but also from your internet service provider (ISP), i.e. Comcast etc. Sometimes using a VPN can also result in faster internet browsing speeds. It takes two minutes to setup and anyone can do it. Cloudflare provides a popular, free VPN service. Keep Software Updated. This one is dead simple. Make sure your computer and mobile device operating system is always updated to the latest version. Turn on automatic updates to make this an even simpler process. Updated software often includes patches for security vulnerabilities and loopholes hackers can exploit. We don’t have control over how companies secure their data, so that remains a point of vulnerability. There are a number of other steps you can take beyond these three, but the important lesson is to remain vigilant as you browse. A VPN and the latest software can be very helpful, but even these can fail if you don’t think critically before clicking on that suspicious email or website.